According to data obtained from the Social Security Administration (SSA), Charlotte is the seventh most popular girls name in the United States, which means, at some point in your life, you are going to need a nickname for a lady named Charlotte. 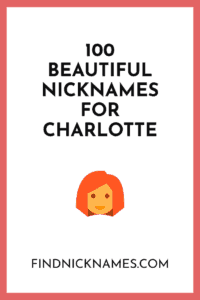 As a parent, if you are thinking of naming your daughter Charlotte, it makes sense to check out the popular Charlotte nicknames out there. In this article, we have listed all the nicknames for Charlotte we could find; both the popular pet names and the occasional ones. Hopefully, you find a cute pet name to call your Charlotte. Charlotte of Cyprus – The Queen of Jerusalem and Armenia who reigned from 1444-1487. Charlotte started becoming even more memorable when there are places named after it. The famous German princess, Charlotte of Mecklenburg-Strelitz married George III in 1761 when she became Queen consort. She had these two towns, Charlottesville, Virginia and Charlotte, North Carolina named after her. If you are one who likes to share a name with prominent people, then here is a list of famous Charlotte’s. They changed their world and are known for positive achievements. Also, you can bet, these famous people were called some of the nicknames listed below. Charlotte Mason – Philanthropist, 1854-1946. Princess Charlotte of Cambridge – The second child and only daughter of Prince William, Duke of Cambridge, and Catherine, Duchess of Cambridge. From Centuries past the name Charlotte has always been popular. It has always fluctuated between the number 50 and 150. In 1982 however, it plummeted to as low as 309. According to the United States Social Security Administration data in 2013, the name ranked number 11 as the most popular girl name. In 2018, the name Charlotte became number 17 in the United Kingdom and Number 1 in Australia. Char – You pronounce the “Ch” as “Sh,” so it sounds like Shar. The names listed here may have you wondering how they are related to the name Charlotte. You find the puzzling, funny, weird and crazy charlotte nicknames in this category. We know you will find one that will have you nodding your head in agreement. Charlottean – Nickname for people from Charlotte, North Carolina, also used as a nickname for somebody named Charlotte. Like other classic names, Charlotte has many diminutives and short forms in different languages. Some are so cute that they will make good nicknames. Here are a few for you to read and know. If anyone catches fancy, be the first to start using it as your nickname. Charlize – Of Afrikaans origin, the name of American actress of South African birth, Charlize Theron. There you go! All the beautiful forms and pet names for Charlotte. Now, it’s your turn to tell us all the wonderful Charlotte nicknames that aren’t listed above.